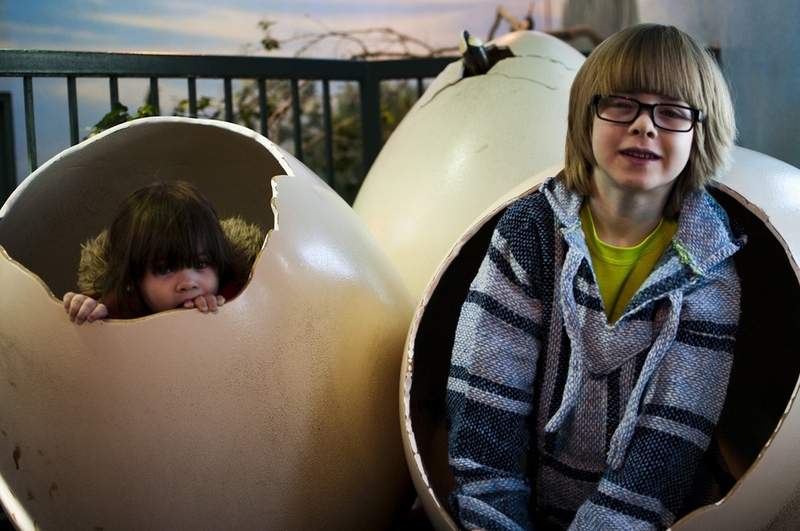 Eve & Luke hang out in a couple dinosaur eggs at the Kinsmen Discovery Center Aviary. Did you know that Churchill, Manitoba is the polar bear capitol of the world? The small northern Canadian town sees an average 1,200 unique polar bears every year. Although Winnipeg is far south of Churchill (thank goodness, it's cold enough here as it is! ), we still love our big beautiful polar bears. The Assiniboine Park Zoo is currently undergoing a 200 million dollar redevelopment, the star attraction being the International Polar Bear Conservation Centre and Journey to Churchill exhibit. Although the major construction will continue into 2014, the zoo remains open and exhibits are available to the public as they are completed. It's very exciting to see such positive change happening in a place I've loved since childhood. This weekend we decided to do some exploring and visited the snowy zoo. Our newest polar bear Hudson was in his temporary environment and not easy to see (so many fences!) but was obviously a stunner. We checked out some of the indoor exhibits, visited the bison, and got a lot of fresh air. With all the construction, I was totally turned around! The new maps helped, and a volunteer guided us when we needed it. We ended up at the brand new grill and polar playground. This was a highlight of the day. The kids loved it. FYI, the tunnels go on forever, the twisty slide is surprisingly fast, and adults can fit. I tested it out, so I know. Here are a few photos of our day. Something cool about our new site is that when you hover over the photos, you may find a caption or anticdote about that image. These are the small details that sold me on the big move. Luke sizes up his hand to a polar bears paw print. The renovated barnyard with "PONIES!" Eve was excited. Indoor aquariums of tropical fish in the Kinsmen Center. This guy is one of my favorite zoo birds. Cranky and cute, just how I like 'em. Eve breaks the glacier and dances on water in the Polar Playground. Luke plays the virtual icicle xylophone. It was a fun day. If you're in town, go show your support for a place that enriches the lives of everyone who comes here. Lune loves the Assiniboine Park Zoo!